Four Boston Latin School sophomores involved in the Aquarium's Teen Programs recently traveled to Washington, DC for the 3rd Coastal America Youth Summit. The summit is designed to teach high school students about the interconnectedness between the ocean, Great Lakes, inland seas and climate with particular focus on climate change and help prepare them for future careers in ocean and climate science and policy. The Aquarium delegation to the 3rd Coastal America Youth Summit. 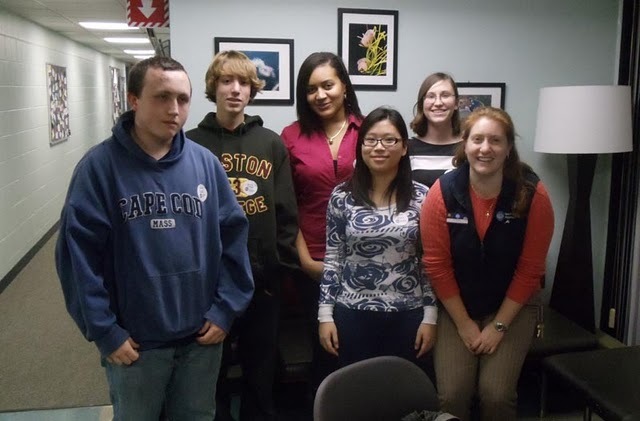 They presented about ocean hypoxia in the southern Gulf of Maine and its effects on Atlantic herring. The presentation was webcast live through the Ocean Portal and included a video and a synopsis of their action plan. Check out their short three minute video about herring below, which features testimony from Aquarium biologist Scott Dowd. The students also met with politicians from the Boston area to talk about climate change and other legislation that will help our oceans in New England. Liz Whitlinger, Teen Programs coordinator, has high praise for the students in her group. "These kids are doing amazing work and are a true testament to our future leaders of a Blue Planet!" They will be working to carry out their action plan throughout the year of 2011, so stay tuned. Groupon teams up with the Simons IMAX Theatre!